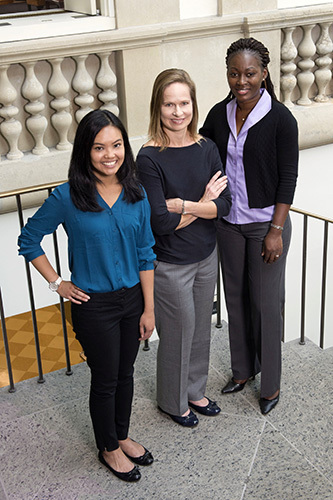 Winship genetic counselors, Christine Tallo, Christine Stanislaw, and Fabienne Ehivet. Genetic counseling is now being offered to patients at Winship Cancer Institute of Emory University in Johns Creek. Fabienne Ehivet, MS, CGC, of the& Winship Genetic Counseling Program provides comprehensive genetic counseling to individuals and families at increased risk for hereditary cancer. In some families, genetic changes are passed down through generations and some individuals are born with genetic changes that could predispose them to developing cancer later in life. However, inherited forms of cancer only make up 5 – 10 percent of all cancer cases. "We're excited to expand genetic counseling services in Johns Creek to reach more patients in North Fulton County," says Christine Stanislaw, MS, CGC, director of genetic counseling for Winship Cancer Institute of Emory University. "The first step in a genetic counseling evaluation is to take a detailed family history," Ehivet explains. "We want to know who had cancer, their age at diagnosis, and what type of cancer they had. That information is used to discuss possible hereditary cancer risks, genetic testing options, and recommendations for medical management." Winship genetic counselors are all board certified. They evaluate patients to determine their potential for hereditary risk for several types of cancer including: breast, colorectal, gastrointestinal, kidney, stomach, ovarian and uterine. To make an appointment with a genetic counselor at Winship call (404) 778-1900.